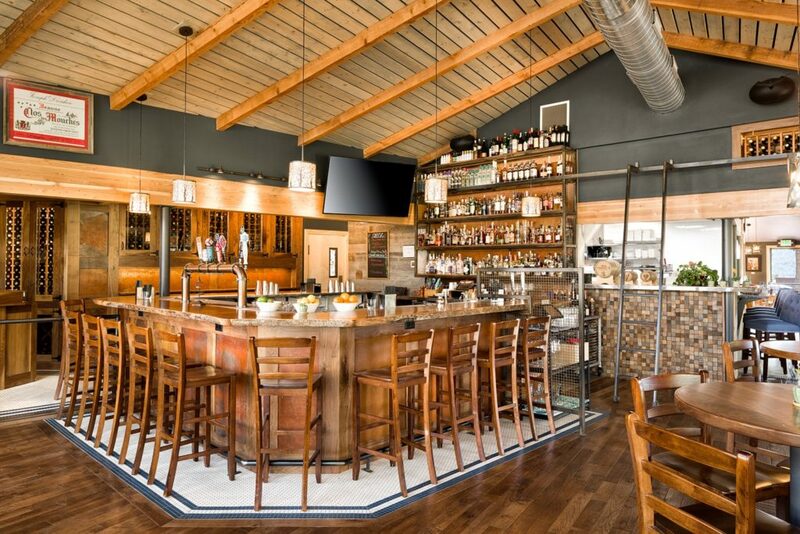 Current owner Melissa Strong and partners John Witmer and Ethan Brown came to BAS1S after purchasing a longstanding restaurant building on the outskirts of Estes Park and near the entrance to RMNP. The location was ideal, but the building was a hodgepodge of 50+ years of disconnected renovations. Not knowing what we would find, the demolition of the interior space allowed us to shape our design. Many parts of the interior ceiling were strangely pasted together over the years and once it was stripped down to the bones we could clean it up, but also highlight the eclectic nature of this building that evolved over decades. We decided to keep some of the funky, cut-up nature of the ceiling while reworking the entire floor plan. Using regional materials complimented the vision of the owners to source regional foods in a seasonal and rotating menu. While Estes Park has a large tourist population, Bird & Jim wanted to provide a strong affinity and support to the local community. The architecture reflects that by retaining the history of the building while creating a visually interesting, welcoming and modern, friendly feeling space. Originally the restaurant was dark and cut-up with the kitchen buried deep within. The new owners wanted to showcase their culinary skills, so we created a centralized kitchen, open to diners. 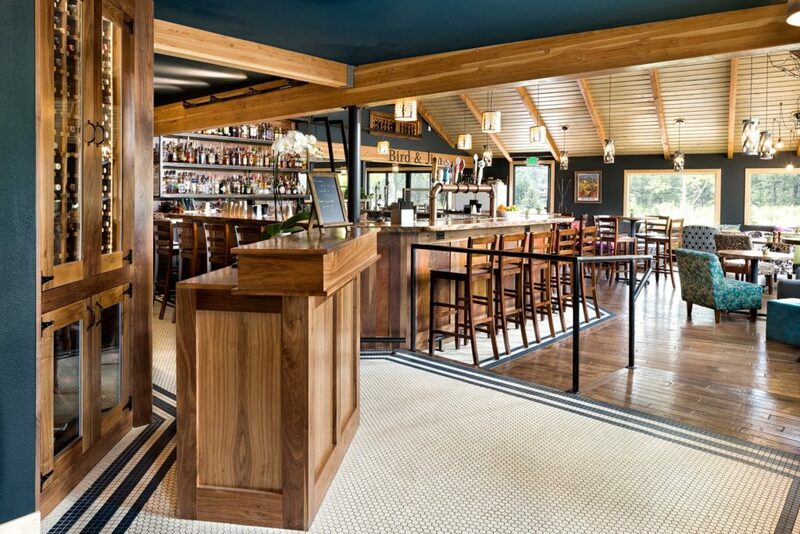 The front section was converted into a large bar area with high tables and lounge seating so more casual diners could mingle and enjoy their approachable yet foodie-loving menu and crafted cocktails. The centrally located kitchen acts as a gateway into the main restaurant. Diners are able to sit at the counter height chef’s table to watch the kitchen staff craft their dishes, or be seated in the light and open space on the back side of the restaurant. We added a glass overhead door so when weather permits, the space can be opened up and expanded out onto the patio area with Continental Divide views. Because we retained some of the original character of the space, we wanted to choose finishes that had a timeless feel blending with a modern approach. 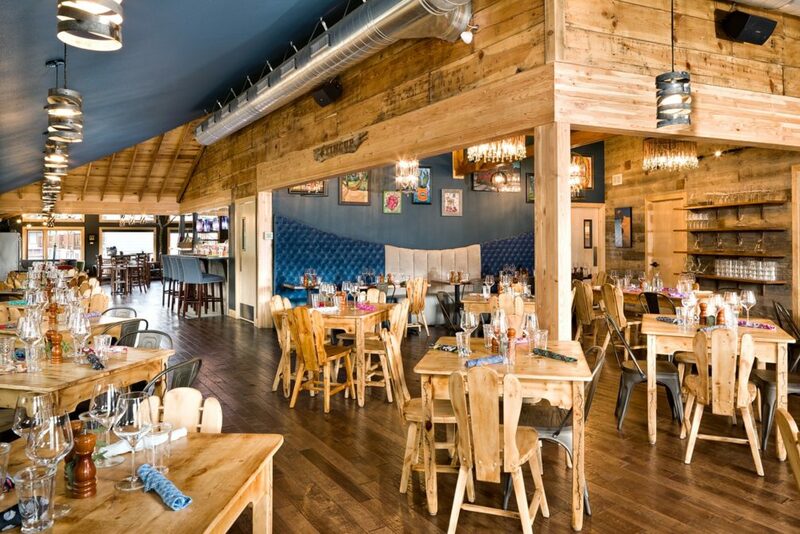 Our design goal was to compliment the owners mix of eclectic preparation of fresh, locally sourced menu choices that are rooted in traditional favorites. Mixing hexagon tiling and wide plank flooring with modern fixtures and rustic wood accent walls create a modern mountain style that feels both fresh and as if it’s been part of Estes Park’s long and fabled history.